Many kinds of food crops need insects to pollinate them. There's no way around it. Without pollinators (like bees) a large portion of the planet would be dead. So it's alarming to hear about global bee populations disappearing, something that's been going on for years, and there's no explanation as to why. Officially it's called "colony collapse disorder". Some people think the bee deaths are being caused by pesticides. Others say cell phones. Others say a disease. The model has been working well for them to date, but there's always room for improvement. What to do? Well, if you're Monsanto you buy a private company called "Beeologics" --- a research venture which claims to have invented a compound that prevents colony collapse disorder. It sounds nice, but is their actual goal to save the bees? Some say no, rather the goal is to control pollination. Now that genetic modification has gone mainstream, the possibility of developing transgenic bees is within reach. 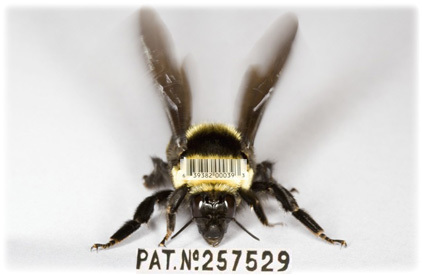 Within the decade, we may see the introduction of GMO bees which are engineered to only pollinate GMO crops. In a world of collapsing bee populations, this could mean the end for certain non-GMO crops. And that would be a disaster. Behind the scenes, the race is on to control the world's pollinator species. 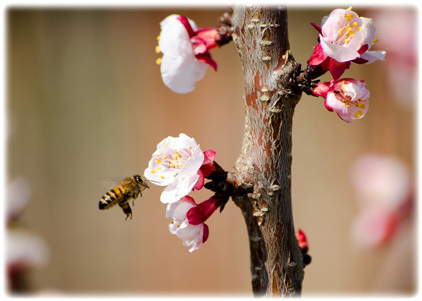 Approximately 80 percent of all flowering plants (fruit trees, alfalfa, berries, nuts, and hundreds of important crop species) require pollination --- mostly by insects such as bees. Obviously, crop pollination is the "choke point" for a good portion of the global food supply. We need to keep genetic engineering out of it. Which is why now, more than ever, consumers can have an impact by refusing to buy genetically-modified foods, and instead insisting on local, organic foods from farmers they know and trust. Organic farmers can't use GMO seeds, synthetic fertilizers, or synthetic pesticides. They are the opposite of the diabolical "industrial food model". Every food dollar that is diverted away from industrial farms and spent at local, organic farms is a "win" for humans, animals, and the planet.